"No one else has to do chores at their house!" “I don’t want to grow. I just want you to understand and listen." If you have ever heard any of the above sentences, this class is for you. If you've said the words, "If I ever treated my parents the way my child treats me," this class is for you. If you're trying to figure out how to teach your fourteen year-old daughter how to be grateful...your ten year-old son to respect you...your twelve year-old daughter to be more confident, then we've got the class for you. In this seminar, we look at what it means to bring those good old vintage values into a modern world. We'll talk specifically about how to deal with issues that are more rampant and concerning than ever before: disrespect, entitlement, and the oceans of emotions that seem to be swirling around the culture and the kids we love. We'll also look practically at how to teach your children values like confidence, forgiveness, and responsibility. 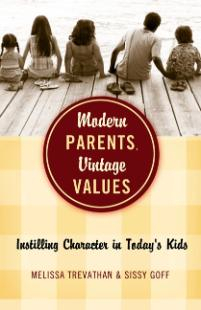 And then we'll land on some timeless truths...ideas of ways to lead your child to become sure of who they are in the security of you as their wise, connected, respected modern parent.